The SurroundSupervisor acts as an interface between the hearing system and the environment, ensuring perfectly optimized spatial acoustics. The program integrates perfectly into the hearing system wearer’s everyday activities by analyzing and identifying the environment. More than 30 high-resolution sensors make the results more precise than ever before: the SurroundSupervisor analyzes the current surroundings and determines the correct proportions of each of seven possible standard situations: four speech situations, two more situations without speech, and music. It passes this percentage distribution onward to the signal processing block so that it can serve as an input variable for AutoSurround. The optimal environmental mix: a snapshot of the current acoustic situation. The blend of up to seven weighted standard situations precisely reflects the wearer‘s current acoustic environment. Hearing systems need to provide optimal speech clarity along with brilliant sound quality – in any number of acoustic environments. This is impossible with fixed frequency response characteristics and hard-coded adaptive parameters, because everyday life happens in a wide range of settings. The system needs to adjust to the circumstances while being worn. Manually switchable programs would be one option, but HANSATON offers a much more pleasant and comfortable solution in the form of its automatic program, AutoSurround. Optimized programs can be created individually for various situations, but their real power only becomes evident in combination. The secret behind the natural hearing experience HANSATON‘s AutoSurround provides lies in its ability to control program interaction automatically. AutoSurround uses the list of programs and automatically changes hearing system settings based on which environment the hearing system wearer is in, with no manual switching required. It detects environments with the help of an intelligent classifier that triggers parameter changes based on the programs created by the acoustician – a perfect acoustic mix. Together with the individually tailored programs, this opens up an endless array of options for providing adequate acoustic support in any given everyday situation. Changes of parameters are so slow and gentle that they are inaudible. As such, they are not designed as »absolute« situations, but can apply any value and thus accommodate so-called »intermediate« situations as well. For the wearer, this means the acoustic environment is reflected even more naturally. Optimal settings: easier and more comfortable than ever before. Final parameter settings depend on how the classifier weights them for the situation in question, so manual switching is never necessary. This enables hearing system wearers to forget about their hearing loss and focus on what really matters: the situation they are currently in and what it holds in store for them. Life in the here and now, thanks to HANSATON‘s new ease of hearing. AutoSurround – the automatic program for every situation. Amplification settings: Each of the seven situations is associated with a defined change in amplification. 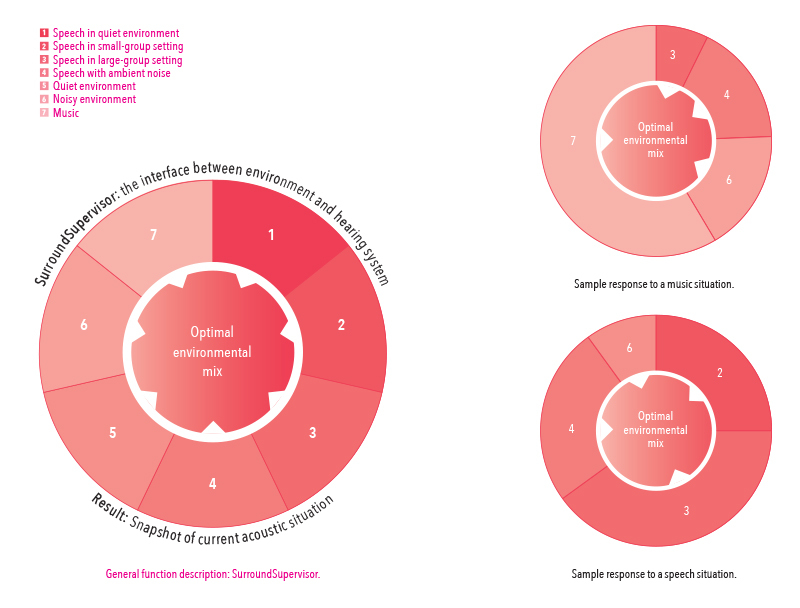 In music environments this change is made based on the preferred music style defined in scout. Speech enhancement (ConversationLift/SpeechLift): The light gray bars in scout show the speech enhancement effects for every situation and every selected value. Ambient noise reduction via the Background Noise Manager: The dark gray bars in scout show the ambient noise reduction effects for every situation and every selected value. Microphone setting controls: If desired, the microphone mode to be used can be preselected, and this choice will be accounted for when making adjustments. These functions are intelligently adapted to one another to provide hearing system users with the perfect results. In the scout fitting software, these parameters help provide convenient, precise regulation of speech clarity and hearing comfort. It doesn’t get any more natural or comfortable than this: with the HANSATON BiLink, hearing system wearers can enjoy optimum-level hearing in both ears. Cutting-edge signal processing allows the highest-quality synchronization between high-tech hearing systems. BiPhone allows stereo hearing on the telephone as well. A binaural hearing experience with BiLink. Two ears can hear better than one: BiLink wirelessly syncs two hearing systems in terms of program or volume settings as well as signal processing. 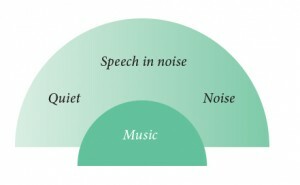 This binaural spatial signal processing is what makes speech detection possible in 360° mode, even in very noisy environments. High-resolution sensors also scan the acoustic environment. By coordinating the microphones on the two hearing systems and analyzing the hearing system wearer’s environment, BiLink helps innovative functions like SurroundOptimizer and SpeechBeam+ work as efficiently and exactly as HANSATON’s groundbreaking ease chip technology allows. BiLink also allows users to stream audio signals through the uDirect 2 (or uDirect 3 for Ease HD hearing instruments) remote control or the BiPhone function. In other words, BiLink is the intelligent foundation for a path toward a natural hearing experience. Full telephoning enjoyment with BiPhone. When telephoning using a landline or cell phone, BiPhone users can transfer speaker voices from the phone ear to the other side. HANSATON’s BiPhone thus enables stereo hearing on the phone without any additional equipment. This transmission improves speech intelligibility and makes telephoning easier for the hearing system user. Most Hansaton hearing systems can be controlled by remote control. These allow the volume to be discreetly adjusted or the hearing programs on your hearing systems to be switched. However, Bluetooth-enabled remote controls offer much more. For example, they allow direct, wireless contact with the TV or stereo system and make it possible for the hearing system to operate like a headset. Easy data transfer with iCube II: More lightness with adjustments, iCube II uses the wireless ability of the hearing systems enabling a completely wireless adjustment and simplifying the transfer of adjustment data between the computer and the hearing system. Multimedia hearing enjoyment with uDirect2: uDirect2 stands for pure multimedia. It enables connections to mobile telephones, television sets, FM receivers and MP3 players, with or without cables depending on personal preference. It therefore ensures a particularly clear and interference-free hearing experience during many different activities. The highlight is the particularly long streaming time, which gives your customers even more freedom. Simply comfortable: RCV1 Remote control: RCV1 remote control discreetly controls the volume and the hearing system programs. Its big and specifically marked keys make it particularly easy to use. uMic – Understanding conversation partners more easily: uMic is a wireless microphone system which enables hearing systems wearers to understand conversation partners considerably more easily and clearly even in difficult acoustic situations. uMic can be attached via an integrated clip on the clothing of a conversation partner. Speech signals from the other person are transferred in a clearly understandable manner via uDirect2 to the hearing system wearer. Full TV enjoyment with uTV3: Via Bluetooth uTV3 easily sends audio signals from the television set, the stereo system or any other audio source (e.g. computer) through uDirect3 and uStream to the hearing systems. uTV3 enables wearers to gain maximum enjoyment from watching TV. uTV3 by Hansaton is also used as a charging unit and mount for the streamer uDirect2. scout – the new path. Even the best hearing system can only perform at its true level of capability when programmed using excellent software. High-quality content and practicality for everyday use are basic requirements for any modern software. An intuitive user interface helps ensure effective fitting. HANSATON kept these objectives in mind when developing its innovative new fitting software, scout. It allows precise adjustments to any personal or audiological parameters relevant to an individual hearing system wearer, and distinguishes itself through its logical, thematically oriented structure. What does that mean for the fitting process? Fast, easy access to the different features, and thus efficient programming. The details are what make scout truly shine. When developing scout, HANSATON placed special importance on giving users detailed access to the available parameters, thus ensuring them maximum freedom of action. Fulfilling modern design requirements was another priority, in order to give users a pleasant working experience – right down to the smallest detail. After all, the software is more than just a means to an end. It is one of the most important tools of the acoustician trade. The new ease of hearing, thanks to scout by HANSATON. scout leads users safely and easily through the entire fitting process: from hearing system selection (visualized using detailed illustrations, short technical descriptions, and definitions of the acoustic connection to the ear) to innovative automatic presets to supplementary accessories. 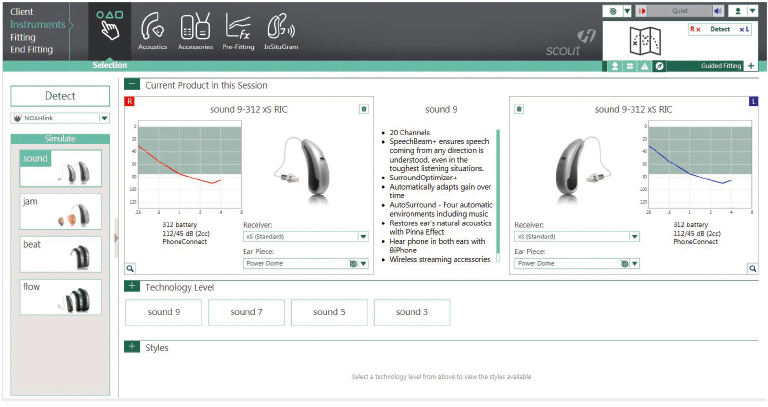 scout is a high-quality, reliable tool to help acousticians achieve their goal of finding optimum individual hearing system settings. And thus creating the new ease of hearing.